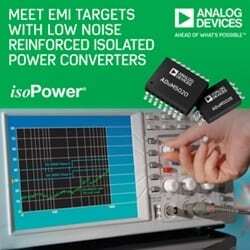 Analog Devices, Inc. (ADI) announced its latest generation of reinforced isolated power converters, setting a new benchmark for low component-level radiated emissions allowing systems to meet EN 55022/CISPR 22 Class B Electromagnetic Interference (EMI) standard requirements. The ADuM5020/6020 and ADuM5028/6028 series eliminate the need for costly EMI mitigation techniques at the application level and simplify the EMI certification process reducing design cost and time. Emerging safety-critical applications, such as Electric Vehicle and Hybrid Electric Vehicle (EV/HEV) automotive battery monitoring and industrial programmable logic controllers (PLC), require compact and dense isolated designs that deliver size and weight savings, strict emissions compliance, and reliable protection from high voltages for people and equipment. Use of these devices can achieve emissions targets on a two layer PCB, which reduces the solution size by as much as 70%, and decreases the material cost by 30% compared to a four layer board. The new series of 500mW DC-DC power converters builds upon ADI’s iCoupler® and isoPower® chip-scale transformer technologies to support high temperature operation up to 125ºC and the smallest 8-lead form factor. The 16-lead ADuM5020/6020 and the 8-lead ADuM5028/6028 are the first devices in the series.